KENKEN is a math puzzle created by Japanese mathematics instructor Tetsuya Miyamoto, to "improve students’ math and logic skills." You can have students work on interactive puzzles or print them. Puzzles are on 4x4 (beginners), 5x5, 6x6, 7x7, 8x8, or 9x9 (advanced) grids. Click here for more information! 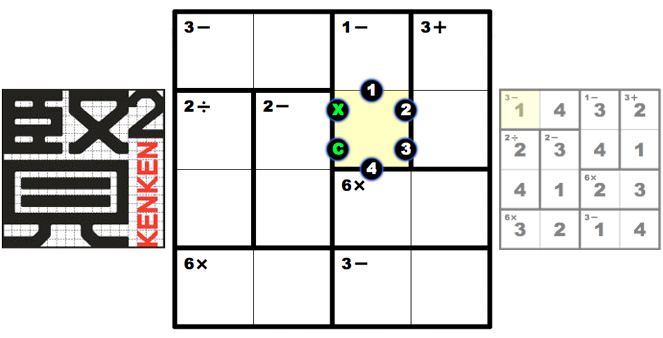 Below is an example of a 4x4 puzzle. Kids practice addition, subtraction, multiplication, and division skills. They must rearrange the numbers so each row and column has the numbers 1-4 with no repeats.